Blues artist Michael Powers loves the guitar. Even before he could play, as a kid he carried his guitar with him everywhere. "The guitar was my thing. I always had it in my room, but I couldn’t play it. But I always had it. I’d walk around the house with it. I’d go to school with it," he told Here & Now's Jeremy Hobson. Since those days, Powers has made his professional home at Terra Blues, a club on Bleecker Street in New York City. New York is one of the centers of global music. And yes, that means big name celebrities and artists, but it also includes countless professional musicians who pay the rent and support their families by performing week after week, year after year. "I never looked at it as a job, I looked at it as this is what I do." Powers has been playing at Terra Blues for 24 years. "It’s what I was put here to do," he said. "I never looked at it as a job, I looked at it as this is what I do." Powers is a self-taught musician. Growing up, his father was rarely at home in New Jersey. As a merchant seaman, he spent most of his time traveling the world. At the same time, Powers' mother had polio. "We never went out," he remembers. "But this guy from my congregation - this guy named Frank Delio - he was an amazing guitar player and teacher. He had books out at stuff. Out of his heart, my mother convinced him to let me go there 'cause my father was never around." Frank taught Powers how to tune his guitar and then he listened. "That’s when I could go and follow people and watch people. There was a lot of bands in my neighborhood, like there are gangs now here, we had bands." Music was all around him. He would DJ his mom's parties, playing Muddy Waters and Chuck Berry - music that inspired him. And he would take the records to school for show and tell. Even after 24 years at Terra Blues, Powers plays with an energy that captivates his audience. His facial expressions move with the music. "I'm in the zone," he said. "I siphon out all the noise that is negative and keep only the positive noise inside." 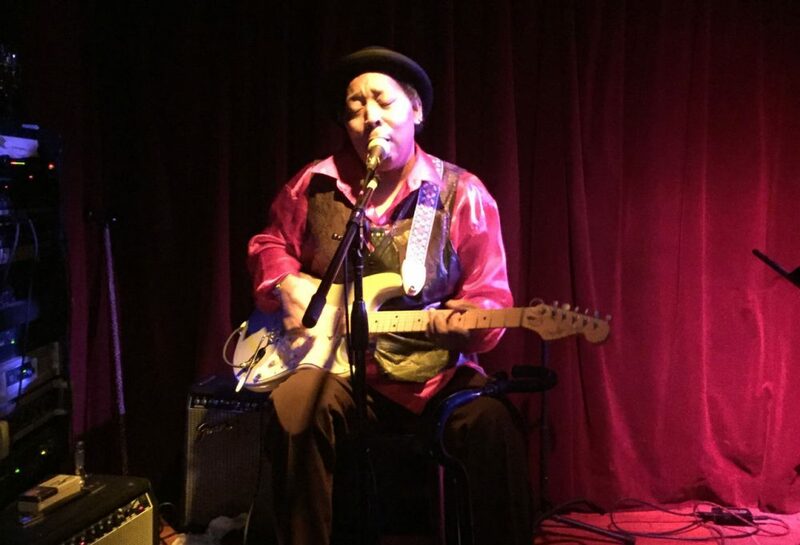 Michael Powers, blues guitarist and vocalist in New York City. This segment aired on April 14, 2015.